Carlos Gomez slides home with the winning run as his teammates celebrate as the Twins beat the Detroit Tigers in game No. 163 to clinch the 2009 American League Central Division title. 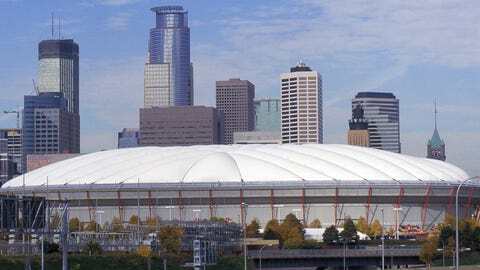 For 28 years, the Minnesota Twins called the Metrodome their home. There were certainly some drawbacks to playing in such a sterile environment with artificial turf and a Teflon roof, but the Twins had some very memorable moments during those years. Soon, the site of those memories will be gone as the Metrodome is scheduled to be demolished next month. In anticipation of the Dome’s final days, here is a look at the Top 10 Metrodome moments in Twins history. One of the most iconic images from the Twins’ time in the Metrodome is fan favorite Kirby Puckett, running around the bases as he pumped his fist following his walk-off home run in the 11th inning of Game 6 of the 1991 World Series. Puckett took Braves reliever Charlie Leibrandt deep to left-center field to force a Game 7. The call on the TV broadcast by Jack Buck was equally as iconic as the home run, as Buck uttered the words, "And we’ll see you tomorrow night!" Earlier in that game, Puckett had another memorable play when robbed Atlanta’s Ron Gant of extra bases by leaping along the outfield wall in left-center to make a catch against the plexiglass. Puckett was a fan favorite throughout his Hall of Fame career, but no one game helped cement that legacy like Game 6 in 1991. With Atlanta’s John Smoltz on the mound for Game 7 of the 1991 World Series, Minnesota needed to respond with an equally strong pitching performance. Veteran right-hander Jack Morris did just that — and then some. In his only season in a Twins uniform, Morris delivered arguably one of the best starts in franchise history. He went the distance in Game 7, scattering seven hits while keeping the Braves scoreless through 10 innings. When manager Tom Kelly tried to take Morris out of the game, the Twins pitcher refused and told his skipper he could go back out for the 10th inning. He retired Atlanta in order in the 10th to set up Gene Larkin’s pinch-hit walk-off single to score Dan Gladden and clinch the World Series. Just like Puckett was the hero in Game 6, that title belonged to Morris in Game 7. The 1987 Twins team wasn’t a particularly great one — they finished just 85-77 in the regular season and were an abysmal 29-52 on the road — but Minnesota found its way into the World Series that year. It marked just the second World Series in team history as the Twins lost it in 1965. Led by the likes of Kent Hrbek, Frank Viola, Gary Gaetti and Puckett, Minnesota won the American League West and defeated Detroit in the American League Championship Series to earn a spot in the World Series. It was there that the Twins took the St. Louis Cardinals to seven games, culminating with a pair of wins at the Metrodome. Each team won all of its home games in the series, and the Twins clinched their first-ever World Series title on Oct. 25. As Hrbek caught the final out of Game 7 at first base, he leaped in the air and joined his teammates in a dogpile on the mound as the Twins were finally world champions. The Minnesota Twins were determined to close out their final year in the Metrodome with style in 2009, and they did so by playing one of the best regular-season games in recent memory. After the Twins and Tigers finished the regular season with identical records (Minnesota needed four wins in the final four games to force a tie) they needed a one-game playoff to determine the winner of the American League Central. The game was played at the Dome, and what happened that night will live on forever in Twins lore. Detroit took an early 3-0 lead before the Twins rallied to lead 4-3 in the seventh on a two-run homer by Orlando Cabrera. Detroit’s Magglio Ordonez homered the following inning to tie the game, which eventually went into extra innings. Both teams scored a run in the 10th inning — the Twins drove in the tying run off Fernando Rodney — and the game eventually went to the 12th inning. That’s where the unlikely duo of Alexi Casilla and Carlos Gomez combined for the winning run; Casilla slapped a base hit through the right side of the infield, and Gomez flew around from second base and slid into home plate to send the Twins to the playoffs. Before the Twins took on the Cardinals in that 1987 World Series, the players received a homecoming unlike any they’d ever seen before. The team plane flew home from Detroit and arrived in the Twin Cities late that night. Before the players headed home, they had to make a detour at the Metrodome, where thousands of eager fans awaited their arrival. The Twins were initially told that there were 5,000 fans waiting for them, and that number eventually grew to 10,000. By the time the Twins players walked through the door and onto the turf field, the Metrodome was nearly full of 60,000 screaming fans. Even more than 25 years later, the players who were there that night talk about some teammates being moved to tears. "To show their appreciation and affection for 25-plus guys that gave the Minnesota Twins an opportunity to participate in a World Series, that night was unbelievably special," said Tim Laudner, the catcher on that 1987 team. "The emotion that you saw on those players’ faces that night was truly genuine." Kent Hrbek quickly became a favorite among Twins fans for several reasons, including the fact that he was a Minnesota native. But there’s still one Hrbek moment that stands out for Twins fans more than 25 years later. In the bottom of the sixth inning of Game 6 in the 1987 World Series, Minnesota was clinging to a narrow 6-5 lead over St. Louis. Hrbek stepped to the plate with the bases loaded and two outs, with Cardinals reliever Ken Dayley on the mound. The left-handed Hrbek swung at the first pitch he saw and drove it to straightaway center field for a grand slam that broke the game open for the Twins. Hrbek raised both of his arms as he rounded first base, knowing that his grand slam helped send Minnesota to Game 7. :I think Hrbek’s grand slam was one of the more exciting things I’ve ever been a part of in the World Series," said former manager Tom Kelly. "It seemed like the place was going to blow up almost, it was so loud." While there were plenty of great Twins moments in the Metrodome, fans in Minnesota also got to witness some history that didn’t necessarily pertain to their team. Three different players — all now in the Baseball Hall of Fame — collected their 3,000th career hits at the Metrodome, and one of them happened to do so in a Twins uniform. That would be St. Paul native Dave Winfield, who hit a single through the left side of the infield off Oakland reliever Dennis Eckersley on Sept. 16, 1993. Winfield finished his 22-year career with 3,110 hits, but No. 3,000 came not far from where he grew up. Joining Winfield on the list of players who hit No. 3,000 at the Metrodome are Eddie Murray and Cal Ripken Jr. Murray’s milestone came in 1995 while he was with the Cleveland Indians; he singled to right field to become the 20th player in baseball history to reach 3,000 hits. Five years later, Ripken joined that club on April 15, 2000 with a base hit to center field. In the span of seven years, the Metrodome was the site of history for three future Hall of Famers. Only five Twins pitchers have thrown no-hitters since the team moved to Minnesota in 1961, and two of them took place at the Metrodome. Scott Erickson was the first to do so when he held the visiting Milwaukee Brewers without a hit on April 27, 1994. Erickson struck out five and walked four as the Twins’ bats gave him six runs to support his no-hit effort. Four years later, Eric Milton tallied the second no-hitter in Metrodome history when he blanked the Angels in just his second year in the league as a 24-year-old. Milton dazzled by striking out 13 batters and walking just two in Minnesota’s 7-0 victory. That was the last no-hitter thrown at the Metrodome by a Twins pitcher, and only one player — Francisco Liriano — has thrown a no-hitter since. This is a moment that Twins fans love to remember, and Atlanta Braves fans try to forget. In Game 2 of the 1991 World Series, Atlanta’s Ron Gant singled and reached first base, where Minnesota’s Kent Hrbek was playing. As the relay throw from the outfield came in, the ball was fired back to Hrbek at first. Gant retreated to the bag, and Hrbek tagged Gant on the right leg. The momentum of the two players carried the play off the base, where Hrbek held Gant’s leg as the first base umpire ruled it an out. Gant argued that Hrbek pulled him off the base, while Hrbek to this day denies that claim. "I think if people look at the play and watch the play and see what happened, he falls off the base and I just keep the tag on him," Hrbek said in 2011, when the Twins immortalized that play with a bobblehead of he and Gant. "People said I pulled him off the base. I didn’t knock him off the base. He was falling off." His hustle, infectious smile, and big World Series moments made Kirby Puckett perhaps the most popular Twin of all time. So it was with great sadness that Twins fans gathered at the Metrodome in 2006 to say goodbye to the late Puckett, who died at the age of 45 from a stroke. A memorial service was held for Puckett at the Metrodome, and the Twins estimated that between 15,000-20,000 fans attended the event in the same building that Puckett provided so many happy memories during his Hall of Fame career. Other Hall of Famers such as Cal Ripken Jr., Eddie Murray and Robin Yount were in attendance, as was baseball commissioner Bud Selig. Video highlights were shown on the big screens during the ceremony, and Puckett’s No. 34 jersey was placed on the center field turf with a spotlight shining on it. While somber, the event also allowed Twins fans to say their final goodbyes to one of the team’s all-time greats.